The Executive Chairman of Asante Kotoko, Dr Kwame Kyei has been spotted on his knees praying for Asante Kotoko. The Porcupine Warriors will be hosted by Zesco United in their final Group C game in Ndola on Sunday. The Reds are seeking to book their quarterfinals berth in the CAF Confederations Cup after failing to seal their qualification against Al Hilal in the final group game at Kumasi last week. 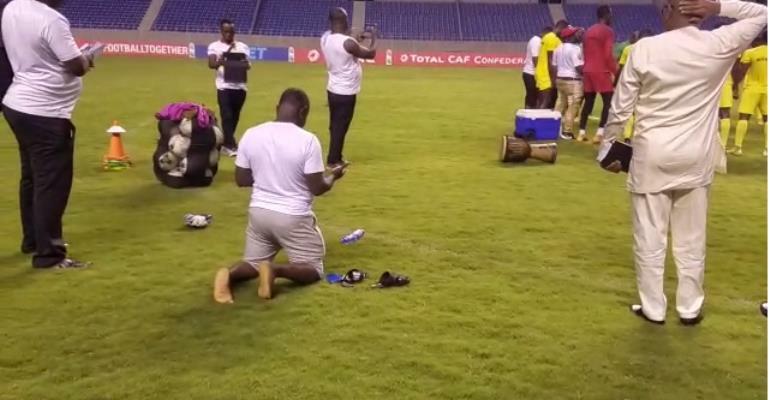 In a video captured at the training grounds of Asante Kotoko on Saturday as they wrapped up their preparations for the game, Dr Kyei was caught in camera, kneeling barefooted and praying earnestly for a miracle on Sunday. The much-anticipated clash has been scheduled to kick off at 16:00GMT.